What Makes OmniWeb 6 Better Than Safari, Chrome, and Firefox? The Internet delivers information super-fast but cluttered web browsers don’t always handle this information in the most elegant of ways. This is why I recently started using OmniWeb again. It’s the only web browser I know of that includes a visible tab drawer and what are called workspaces for quickly managing and restoring webpages. If you find your current browser is typically cluttered with tabs and open windows you should check out OmniWeb, which was recently updated for OS X Mavericks. Test Build or Stable Release? Though OmniWeb was first released back in 1995, its developers admit the web browser is not the primary focus of their work right now. Thankfully the company has found time to update it for Mavericks support. 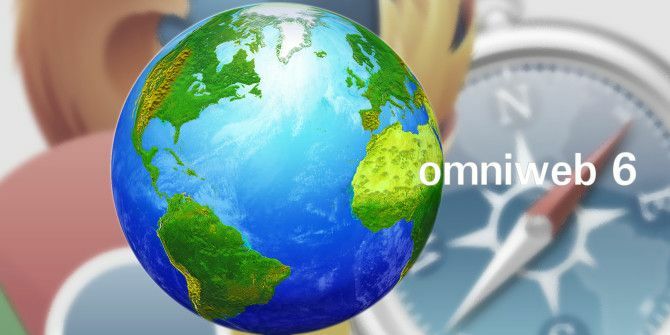 OmniWeb is available in two versions for free download: the stable release (version 5.0), and the test build (version 6.0), the latter of which requires OS X 10.9 (Mavericks). The developers do warn that the test build is “not for the faint of heart” as these are testing builds which update regularly without fully being tested beforehand – things will break. If you’re going to use the test build, run the software update on a weekly basis to make sure you’re using the latest build. If you run into the problems, you can re-download a prior build. Despite a few crashes, the test builds worked fine for me, though I would not suggest at this point making OmniWeb your primary web browser. If you use the test build and you receive a crash report, be sure to forward it to OmniWeb. Don’t let the above warnings scare you away, especially if you’re looking for a better way to manage bookmarks, browser tabs and windows, because OmniWeb excels at this. The big difference OmniWeb makes for me is the tab sidebar and workspace feature. The tab sidebar is not unique, but the feature has been removed in all other web browsers (most recently Opera, reviewed here Opera 15 Is A Faster, Simpler Chrome, And Here Are 3 Great Reasons To Try It Opera 15 Is A Faster, Simpler Chrome, And Here Are 3 Great Reasons To Try It It may seem ridiculous now, but when I was younger, I forked over a great wad of cash for Opera, a revolutionary web browser from Norway. I took it home, excited at finally being able... Read More ), and replaced by other tab viewing methods. Sidebar tabs provide quick visual access to open tabs which means less time hunting for hidden tabs in a cluttered window. The tab sidebar can be positioned to the left or right side of the browser, and tabs can be rearranged, closed, or dragged to a new browser window. This type of setup is perfect for research when you need to switch back and forth between web pages. With other web browsers I typically have 15 to 20 tabs open throughout the day simply because they are not always visible, and because I lose track of pages I’ve already opened. The sidebar drawer can be put into list view, resized, and closed altogether. I typically park OmniWeb on my second monitor where I can browse and review pages as I work. As with other web browsers, OmniWeb provides preferences for opening tabs in the background, opening links in a new window or tab, and receiving a warning when a window of multiple tabs are being closed. Web browsers typically become cluttered when you’re working on a multiple tasks throughout the day. You might download pages for your financial accounts, several job-related pages, a few shopping sites, and even more links from RSS feeds and email. After about an hour or so, your desktop is cluttered with browser windows and open tabs. OmniWeb provides another useful solution called workspaces for reducing this type of clutter. Workspaces allow you to save and re-open a collection of tabs, cutting down on clutter and providing better organization. I keep spaces for my MakeUseOf-related work, other clients’ projects, and my own research projects. OmniWeb only allows one space to be open at a time, which also helps stay focused and stay less cluttered. By using workspaces I spend less time clicking and re-opening webpages and moving windows around. OmniWeb quickly switches between workspaces, and each space gets assigned an F-key shortcut. I use the finger gesture application BetterTouchTool Power Up Your Mac With Advanced BetterTouchTool Automations Power Up Your Mac With Advanced BetterTouchTool Automations I started using BetterTouchTool back in 2011, and since then it has become one of the top three Mac applications for boosting my productivity and streamlining my workflow. Though BTT can be used by any... Read More to quickly switch between workspaces. The best way to create a new workspace is to select Workspace > Show Workspaces, and click on the plus “+” button to create a new titled workspace. Next, open the pages you want to save to that workspace. A workspace can also contain more than one window of tabs. OmniWeb will remember the tabs, windows, and settings of each workspace and restore a selected space the next time it’s opened in the browser. You can also select to have OmniWeb automatically save web pages in a workspace as you download them, or your can choose to have it save only the original tabs and windows. Another useful OmniWeb feature called snapshots is similar to workspaces. Snapshots are used to capture (Workspace > Take Snapshot) everything that is presently in a browser workspace. After more pages are added or after OmniWeb is re-launched, a captured space can be restored to a snapshot (Workspace > Restore Space). I take a snapshot of a workspace after I create it and add initial pages. That way I can get back to those pages if they are accidentally closed. Snapshots are useful for when the application crashes or when you accidentally close tabs. In the workspace manager a camera icon next to the title of a workspace indicates a snapshot was taken. There are several other lesser features in OmniWeb you might find useful, including options to set default preferences (like font size and security settings) for individual websites, as well settings for how pages are downloaded. There’s also a comprehensive built-in help document that explains each feature of the browser. Adding a new web browser to your workflow may not sound like fun, but OmniWeb is worth checking out if you find your current browser difficult to manage. If you enjoy OmniWeb, let OmniGroup know you would like them keep their web browsers updated and available for download. Let’s not let Safari, Chrome, and Firefox be our only options. does firefox have add on which can offer the same functions as the saved workspaces on ominweb ? Anybody has a clue ? Thank you! I was referring to importing bookmarks into Omniweb6 from Omniweb5 (from a different computer). In the meantime I discovered that the Omniweb5 folder (in Library, App Support) has to be copied. Jacques, are you asking about how it's done with OmniWeb? I checked, and OmniWeb does allow for importing bookmarks from Safari, but I don't think it's set up to sync across computers. Hasn't been updated for Windows since 2011. PS: I don't like sidebars at all. Thanks for the feedback, Howard. Yeah, the developers admit that they have put the software on the back burner for quite some time to focus on other products. I'm glad they haven't gotten rid of it all together. Thanks Joel, for the feedback and tip. I haven't used Firefox in a while, but any plugins and extensions that help with managing tabs is a big plus to me. Opera used to have a tabs sidebar, and there was extension that would close tabs after a specified period of time. But for some odd reason, they got rid of one of the main features that made their browser unique. v1adimir, thanks for your feedback. I'm more bothered by dozens of opened and unused tabs than I am by an occasional pop-up ad. But I get your point.